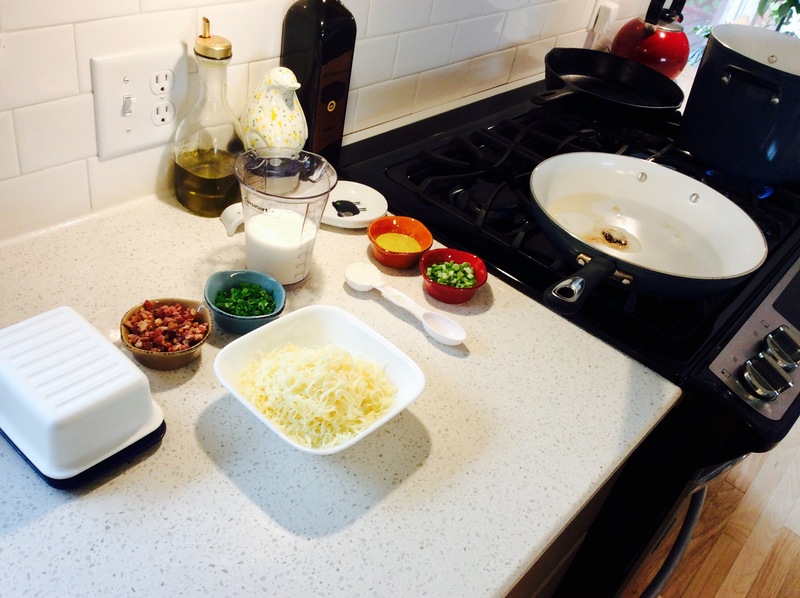 Hello Fresh: Using Their FREE Recipes! Many of you may be familiar with the meal delivery service Hello Fresh but did you know you can use their menu recipes for FREE?! 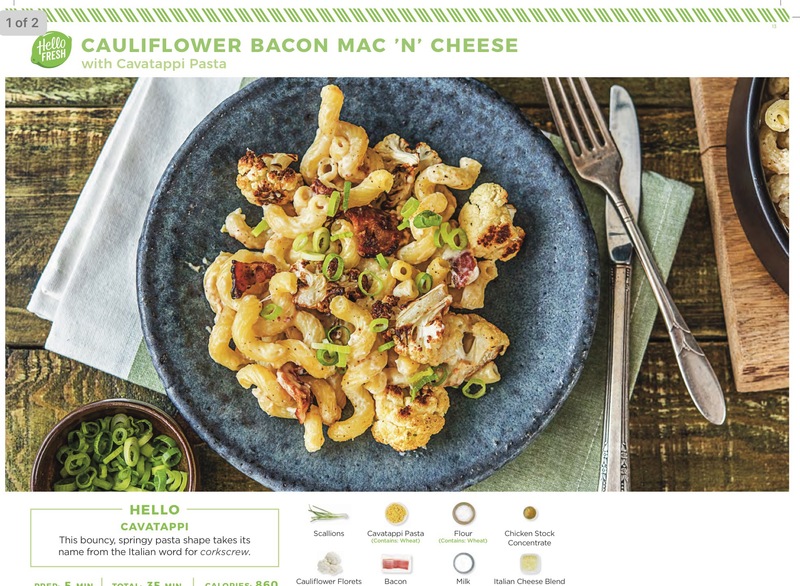 After a friend had mentioned she ordered her recent delivery with the Cauliflower Bacon Mac ‘N’ Cheese, I found myself becoming quite envious. I saw it on the menu lineup but not during the week I had ordered my box, it looked soooooo good! CLICK HERE FOR $40 OFF Hello Fresh! That is 66% off your first order of 3 meals to serve 2! Cancel anytime, choose your menu and skip weeks or months! When my husband asked what we were having for Sunday dinner, I knew what I wanted to try. I went straight to the Hello Fresh website and opened the recipe for this delicious looking dish. I had everything but the cauliflower and the green onions but those were simple enough to pick up from the grocery store. So, I purchased and prepped exactly what I needed to create this cheesy masterpiece. The only change I made was using a different shaped pasta and farmer’s cheese instead of the Italian cheese blend. While roasting my cauliflower in the oven I was able to measure out the other ingredients. I followed the recipe just as I would have if I had ordered the entire lineup of ingredients through Hello Fresh. 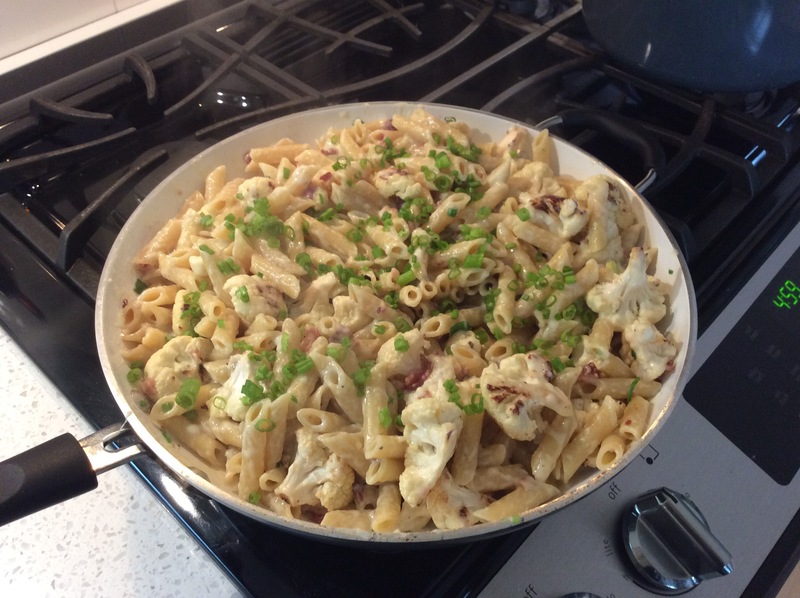 The final results were a little heavier on the pasta but the meal turned out fabulous. My husband loved the change in menu and enjoyed the unique twist made to one of his favorite dishes. The best part is that we had plenty of leftovers for the following day! Using the free access to Hello Fresh’s recipe box was a great way to introduce new, amazing dishes to our dinner repertoire. The step by step directions can’t be beat and it makes meal planning much more interesting when you can see the photos of what you will be cooking. By using the service this way, I can use much of my home grown produce and farm raised meats to create something spectacular and out of the ordinary!